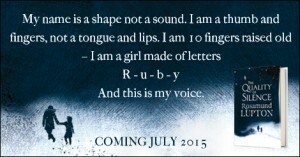 Rosamund Lupton answers questions about her debut novel, Sister. Yes, ever since I can remember. As a child, my best friend’s mother was Anthea Joseph (Hastings), a renowned publisher and a lovely woman, who inspired me at six to want to be ‘an author’ and made it seem achievable. I am sad that I can’t thank her for that now. Q. What is your writing day? I began writing Sister after my youngest child started at school full time. I drop my two boys at school then race back to the house and write as much as I can by three o’clock. I’m lucky that my children ask ‘how many words today, Mum?’ rather than ‘what’s for supper?’, as writing has led to domestic chaos. During the holidays family and friends rally round and I write in the evenings, sometimes into the night. Q. What does it feel like to have your debut novel in print? Astonishing. I walked around on cloud ten for quite a while. It’s also a relief. 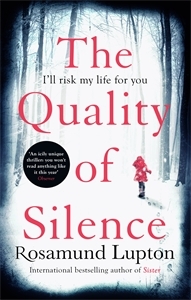 So much work goes into writing a novel – this book took years off and on – and I was anxious that it might all have been in vain. I also find it, unexpectedly, a little daunting – the book is a one-way window, with readers able to see how I think and feel, but not the other way around! That said, it is a privilege and a joy to know that people will read my story. Go for it! And if you meet rejection, keep on going for it. I could have wallpapered a small room with rejection letters before I ‘broke into’ script writing, so I was prepared for that with my novel. There seems to be quite an industry in telling writers how fruitless their endeavours are bound to be. I think you have to know what’s important to you about your book, but also take on the chin what has to be re-written, however drastically, as long as it doesn’t compromise your vision of your book. There’s no doubt that luck is involved – mine was meeting Emma Beswetherick, my editor, early in the submission process. Q. Where do your characters come from and how do they evolve? In Sister I began with a central relationship, rather than the characters themselves – clearly in this book the central relationship is between sisters. I then find a small detail, or turn of phrase, that suddenly lights up a character for me. With Beatrice it was her obsessively neat and anxious pictures that she did as a child. Although she is not based on anyone I know, and is completely imagined, I couldn’t have written her relationship with Tess without being close to my own younger sister. The emotional truth is one that I know well. The minor characters start as simply puppets of the plot but after a while they snip the strings and acquire a life of their own; just as Beatrice and Tess became more than vehicles to show a relationship. At some point the characters take over and that is when writing becomes a magical thing for me. Before the last draft, I changed the central characters’ names and then read it again, as if meeting them for the first time to see if they seemed real. Q. Did Sister throw up any surprises for you? Yes, many. In the story itself I was surprised by how the characters developed, often changing a great deal from my original character sketches. For example, Kasia had a very small role initially, but seemed to demand more story time and to contribute in un­foreseen ways. Other surprises were simply logistical. I hadn’t appreciated how LONG a novel is, compared to the scripts I’d been used to writing, and how hard that middle section of a thriller can be. At one time I felt like a chess player needing to think twelve moves ahead and wondering if my brain was up to it! The ultimate surprise was how hugely satisfying it is to finish a hundred thousand words and have that bulk of paper sitting on my desk. Q. A lot of medical research must have gone into writing Sister? How did you go about your research and was it difficult? I read all I could on genetics – text books, newspaper articles, and the internet. The plot is entirely fictional, but I wanted it to be credible. I would take a documented case, for example the real story of a teenager dying because of a virus vector and the creation of a new micro-chromosome, and marry them together for a fictional genetics story. Fortunately, in terms of how hospitals and doctors work, my husband is a consultant obstetrician, so that was extremely easy! Q. Your debut novel deals with some very dark and emotional issues. How did you go about handling such touching subjects? I went with the characters and story, rather than consciously dealing with issues. I was wary of being prurient or voyeuristic, so closed the door early on a scene rather than dwell too long, trusting the reader to extrapolate for themselves. I didn’t want this book to be dark but hopefully, finally, a celebration of sisterly love. Q. In part this is a novel about the bonds that bind two sisters, but you also blend in elements of crime and thriller. How did this come about? I tried to make the elements of crime and thriller reveal more about the two sisters and their relationship. For example, Tess going missing is the start of a crime story, but as Beatrice flies in to the rescue it also dramatically shows her protectiveness towards her younger sister. Her subsequent determination to find out what really happened to Tess sets the pace for the thriller/crime story but also continually demonstrates the strength of their relationship. There are also subtler interactions. For example, the police reconstruction early in the book, when Beatrice plays the part of Tess, is part of the crime plot but also foreshadows Beatrice’s gradual transformation throughout the rest of the novel into someone more like her sister. Using genetics for the thriller part of the novel seemed apt as I wanted to explore what it means to be sisters – although at the end I discount the idea that their love for each other is based on shared genetics. This question-and-answer session was carried out by Rosamund’s publisher, Piatkus, in August 2010 and was first published in the paperback edition of Sister. I think a part of me is still on that lifeboat with that tiger. And the twist at the end makes what went before even more beautiful. A stunning book that made me realise what crime writing could become. If I could choose one writer to emulate it would be Anne Tyler, whose characters become so rounded that it seems you know them. Strange exciting poetry that is ever-inspiring. I love the zest, wit and originality of Kate Atkinson’s books and in this one especially. Proof that words can do anything! The perfect read for over-active toddlers and frazzled mothers at the end of the day and now instantly evokes that time for me. A great holiday read on the beach and issues to mull over during dinner later. The only book I’ve ever read where I am jealous of people who are yet to read it, that they have that experience in front of them still.